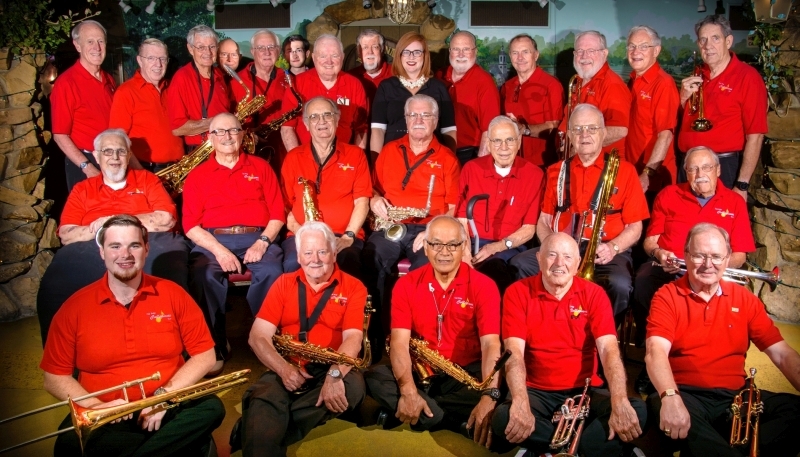 SAN LUIS OBISPO — The Cal Poly Collegians Alumni Big Band will celebrate its annual reunion with a performance from 7:30 to 10:30 p.m. Saturday, Aug. 25, in the Madonna Inn Ballroom in San Luis Obispo. The band’s annual gathering draws more than 20 alumni musicians to recreate the swinging sounds of Count Basie, Duke Ellington, Benny Goodman, Glenn Miller, Les Brown and other famous ensembles of the big-band era. The Collegians, the predecessor to today’s acclaimed Cal Poly University Jazz Bands, was founded in 1937 by then-Music Department Head Harold P. Davidson. Winners of the 2017-18 Cal Poly Collegians’ Jazz Scholarship — trombonists Kent Giese and Davis Zamboanga — will join in the performance. Past reunions have found the alumni band performing at a variety of local venues on the Central Coast, including wineries, parks, shopping malls and San Luis Obispo’s Mission Plaza. The Madonna Inn Ballroom has been the site of the band’s homecoming since 1999, following a personal invitation from the late Alex Madonna. Admission to the Saturday evening performance is free; voluntary contributions to Cal Poly’s Collegians Jazz Scholarship are welcome. The Collegians draw a full house every year, and seating is guaranteed only for those who make a reservation and dine in the Madonna Inn Gold Rush Steak House. Non-diners who wish to dance or listen are accommodated on a first-come basis. To make dinner reservations at the Gold Rush Steak House, call 805-543-3000. For more information about the Madonna Inn and the Steak House, visit the Madonna Inn website. For more information about the Cal Poly Collegians Alumni Big Band or the performance, visit the group’s website, or call Collegians member Phil Steck at 530-277-0966. The Cal Poly Collegians Alumni Big Band pictured at the 2017 performance.